Sorry for the recent silence; I’ve been having a rough couple of weeks on the Life front. No financial crises, though, at least not yet! Thanks for all the recent comments — it cheers me up to see so many people reading. This week got off to an interesting start for us with the early-buzzard circling of Washington Mutual. WaMu has been my primary bank for over a decade, and currently holds all of our liquid assets — currently around $30,000 in checking and savings. Now, all of that money is covered by FDIC insurance, so I’m not worried about a possible bank failure costing me money in the long run. But what about the short run? 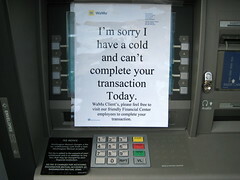 Marc Hedlund posted to the Wesabe blog Wheaties for Your Wallet yesterday with an explanation for “What happens to your money if your bank closes?”. Most of it is based on the experiences of one NetBank customer who reported a delay of two to three weeks before he had access to his money after the FDIC shut NetBank down. She never lost access to her money. Debit cards continued to work uninterrupted for purchases and at ATMs. She lost online account access for two days, over the weekend. By Monday morning everything was available online again. In the interim, phone support and balance queries remained functional. I have no idea why her experience was so different from Wesabe’s informant, but that’s an almost unnoticable blip in service. I’ve been more inconvenienced by Comcast going on the fritz. Yesterday I heard an interview on NPR’s All Things Considered with Hurricane Ike refugees in Houston. I was struck particularly by two things: one, that stores in Houston were running out of food. Wha? I mean, it’s not Manhattan Island here, we’re talking about one of the great highway hubs of the nation, and they can’t truck in nonperishables to restock? And two, that all purchases were cash-only. I couldn’t tell from the report whether this was because of logistical reasons (like power outages) or emotional ones, but it did give me pause. Jak and I typically have no more than $40 cash between us, and often none at all. Seattle is a lot safer than the Gulf Coast, but there’s always the chance of, say, a really big earthquake. So on the list for this week is pulling about $200 out of our WaMu accounts into a Cash Stash. Our biggest problem then becomes keeping it out of the hands of the teenager, who keeps losing her debit card and thinks that we should be her personal ATM. I admit it: Reading about the WaMu stock situation freaked me out just a teeny tiny bit since that’s where all of my funds live. Money stuff is already my weak suit, and I don’t have much of it at the best of times. I’ll work on keeping my panic reflex under control!